But the best part? You’ll still have enough money and time for a fancy Thanksgiving meal. I purchased all of my supplies from Hobby Lobby for under $60, and each DIY takes under 15 minutes to complete. 1. 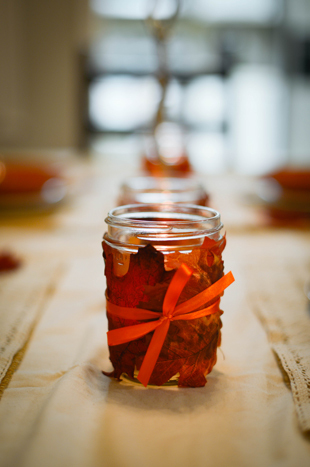 Wash the mason jars (to reduce any sticky residue that could prevent the leaves from holding). 2. Remove the fake leaves from the stem they are attached to. Peel off the hard twig part from the back of the leaves to make them more flexible (so they lay flatter). 3. Cover a part of the jar with Modge Podge and firmly press down and flatten out a leaf onto the surface. 4. After holding for a few seconds, secure the leaf with another coat of Modge Podge (this time on top of the leaf). 5. Repeat with as many leaves as desired or until the jar is covered. 6. Let jars dry for an hour. 7. Tie a thin piece of ribbon around the middle of the jar to add a cute touch. 8. Place a tealight candle inside the jar to create a warm glow for your table. 1. Measure and cut the burlap into 16”X 20” rectangles. 2. Measure the lace ribbon into 20” long strips, and hot glue one strip onto the top of each burlap rectangle. 3. Be careful not to burn your fingers through the burlap! 4. Find a cute font online or create your own font to write something simple and cute in the bottom right hand corner of the placemat. I based my font off of Tom Kolter’s “Return to Sender” font that can be found here. I used a black paint marker to write the word “eat” on mine. 5. Give the placemats a finished look by gluing one to two extra leaves onto the top left corner of the burlap. 1. Pick a font to use on your banner. 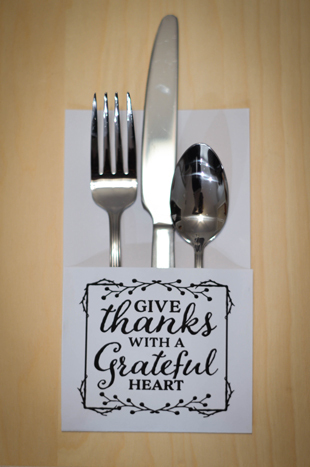 I used the same font as I did on my placemats, but you can browse the Internet to find a font that you want to use. 2. Figure out what to write on your banner. I wrote “Give Thanks” on mine and then cut it in half so it would have an upper and lower banner. 3. Mount the banner on a wall with clear thumb tacks. 1. Unwrap the table runner and lay it on a flat surface (I put newspaper underneath the area I was painting). 2. 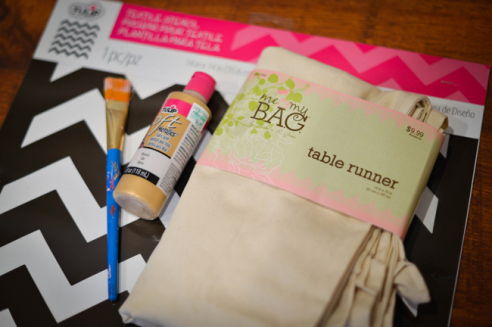 Place the chevron stencil on top of the table runner and make sure it is straight with the points of the chevron facing inward. 3. Squirt paint, about the size of three quarters, onto a paper plate, napkin, or newspaper (I used newspaper because I already had it lying around). 4. Dip your paintbrush into the paint and carefully paint inside of the lines of the chevron stencil. I only painted three chevron lines, because I just wanted to have the detail at the ends of the table runner, but you can do as many chevron lines as you want. 5. Remove stencil and let dry. 1. Download the silverware holder template here. 2. Print out as many copies of the template as you need. 3. Cut along the line between the silverware holder text and fold along each line under the silverware holder text. 4. After folding the silverware holder, put a thin line of Modge Podge or hot glue on each side of the smaller flap, and press down to secure until dry. 5. Slip a fork, knife and spoon into each silverware holder. All you have to do now is assemble your decorations, and voilá! You have the perfect table setup to complement your Thanksgiving feast. Show us your Thanksgiving DIYs! Tag @orangemag_style on Instagram.